Overview: Oklahoma stumbled in 2011 after many (including me) had them number one in the nation. Though a Big 12 title is pretty much a lock thanks to the return of prolific quarterback Landry Jones. Also back is explosive receiver Kenny Stills, sure tackling Tom Wort and strong defensive back Demontre Hurst. The Big 12 is tougher than the Big East but don't expect West Virginia to struggle at all. Geno Smith has a huge arm that will get his amazing receivers, Stedman Bailey and Tavon Austin, the ball. The defense is definitely a problem but this offense is so good that this defense could be the worst in the Big 12 and the Mountaineers would still win 10 games. Brandon Weeden and Justin Blackmon are gone but Oklahoma State is still dangerous. Now, it appears they will run the ball a lot with back Joseph Randle who has speed and power. The defense is decent, but the secondary is stacked with Brodrick Brown and Justin Gilbert. Gilbert is also an excellent returner on special teams. Wes Lunt or Clint Chelf will likely be fighting for Weeden's spot as leader of the Cowboys. TCU is in a tougher conference but the Horned Frogs should still win 10 plus games. Casey Pachall could end up being just as good as Andy Dalton and they have a stacked backfield even if Ed Wesley doesn't play with Waymon James and Matthew Tucker. Gary Patterson loves defense and he has a good unit with pass rusher Stansly Maponga and linebacker Kenny Cain. Collin Klein is back which means Kansas State will win a lot of games. Along with Klein is back John Hubert and a number of good receivers with Tyler Lockett and tight end Travis Tannahill. This defense is decent with Arthur Brown and shutdown corner Nigel Malone. Texas doesn't know who their quarterback is but if they can figure that out they will win games thanks to the backfield. Malcolm Brown will excel and Jonathan Gray appears ready to play in the Big 12 and won't need much of an adjustment period. This defensive line features two sack machines in Jackson Jeffcoat and Alex Okafor. 2011 was the Year of the Bear in the Big 12 but Baylor will fall back to earth a bit. Nick Florence is likely the main faced with the task of replacing incredible RG3. Florence should do good though as he has excellent receivers headed by seniors Terrance Williams and Lanear Sampson. The defense is good with senior Gary Mason and Chance Casey. Texas Tech was looking like a true contender after beating Oklahoma last season but 5-7 was not their goal. 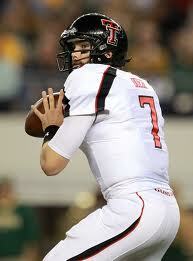 Seth Doege and most of this prolific offense is back which means a bowl bid is a realistic possibility. Iowa State will likely start Jared Barnett who led the upset of OSU last season. He'll improve a lot in his second season. This Cyclones team has a whole lot of talent especially in the linebacker core with A.J. Klein and Jake Knott. Kansas has a new coach in Charlie Weis and hopefully more wins. Dayne Crist will likely start but he doesn't have too much talent around him to work with.